A satirical graphic novel available in Indianapolis area comic and book stores. Ads were everywhere in Marvel and DC comics. I started noticing them in comics from the 1960's X-Men. The X-Ray specs, sea monkies, and strange Hostess ads with the Hulk or Spider-Man were usually badly printed two-toners. Later, there were ads in the 1990's for Nintendo characters and games. What crawls unseen in the dank catacombs beneath the Tower? These nefarious looking insects are milkweed beetles. They are diligent, militant and very aggressive to trespassers. These creatures act as fearsome guardians in the underground tunnels beneath the Tower. They owe their loyalty to Justice Reegen. Their real life counterparts belong to the genus Tetraopes, a Latin classification meaning "four-eyes". Warring factions in the insect kingdoms fight for a valuable prize. This webcomic is an adventure with cartoony charters and some gore and violence. Kingdoms takes the lead character from the first book, The Grand Roach, and sets up a story with him as the leader of a belligerent army. In April 2019, I'll release two chapters. Then, I'll release the third chapter pages weekly. The new idea got itself together on a giant drafting table. Medieval warfare with arrows, bows, spears... I've currently finishing the webcomic pages in Photoshop using an extended version. It has better brushes to digitally ink and color than Illustrator could do in a timely manner. Let me know if you like the bug guts (I do!) - or if the action scenes are too much, or perfect, or what. 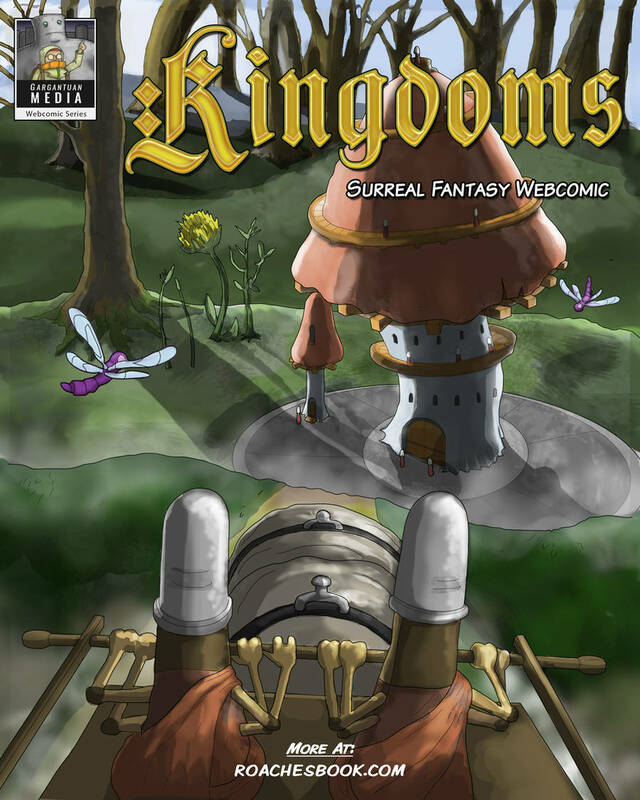 Roaches and Kingdoms by Paul Schmitt and Gargantuan Media. All rights reserved ©2018.